Helen De Chappotin, later to become Mary of the Passion, was born in 1839 in Nantes, France. Already as a child, certain traits in her temperament indicated her future orientations: a need to swiftly implement whatever seemed to her to be good and worthwhile, a love for poor and a chivalrous enthusiasm for what she called ‘The great causes’. The Passion to do well had its roots in her contemplation of God; although a product of her time, and deeply immersed in the 19th century, she was completely open to the future. She faced the world with the realism of the intelligent and informed women, who dared to take a stand for Truth and Charity, to which she had surrendered her life and courage. In 1904, from San Remo, Italy, She returned home to God. Pope John Paul II declared her 'Blessed' on October 20th, 2002. 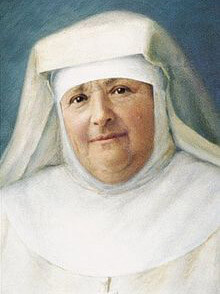 In 1877, she founded the Franciscan Missionaries of Mary, an International Congregation for women. It is the first missionary congregation to be founded by a woman and dedicated to universal mission. Today the Franciscan Missionaries of Mary, belonging to many different nationalities, live and work in more than 76 countries worldwide. Their mission is reflected in many diverse works that are witness to Gospel values, with a commitment to justice, peace and integrity of creation.